Previously we mentioned about Simple Directory Analyzer that can examine folders and files details, here is another similar tool but with much graphics centric that offers you another option in case the previous one doesn’t suit you. The tool is very straight forward without any configuration needed. Just install and once after launched, users can start browsing for the hard disk drive or specific folders. Depending on the hard disk size, it will take couple of minutes to go through the system examination and display a summary pie chart of how the hard disk space has been occupied by different types of files in percentage scores. 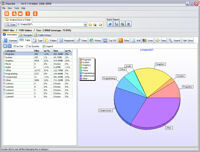 The distribution types could be displayed as in System, Programs, Graphics, Movie, Audio and etc. If you would like to find out more details, for instances, clicking on Type Tab for file types under Programs category will bring out a breakdown summary for all types of files under that particular directories. If these data are needed for any reason, users can get a quick report compilation in any form of html, CSV, XML or text format. Xinorbis v4.0.2 is compatible with Windows 2000/XP/Vista OS (Operating System) and users have an option to install into a USB thumb drive to be used on any portable PC. Users can download the installer or zip version at zero cost.